Local, organic and vegetarian are the three defining pillars of LOV, an airy new restaurant for health-conscious foodies in Montreal’s Old Town. Chef Stéphanie Audet, who previously devised the raw menus at Crudessence, is responsible for the mainly vegan and gluten-free menu here, the ingredients of which she sources from local farms. The beverages follow the same path with a biodynamic wine list devised by Steve Beauséjour and cocktails by Romain Cavelier making stars of lesser-known ingredients and small-batch producers such as Tromba Blanco tequila, CIRKA Sauvage gin and Jaral de Berrio Mezcal – best sipped from the comfort of a hanging white wicker chair. 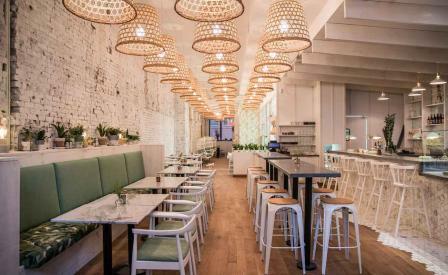 The botanical loving vision extends to the interiors by Jean-Pierre Viau and Jacinthe Piotte, and feature whitewashed open brick walls, a tiled marble bar, plant printed banquettes, terrariums, wicker lobster cage style lampshades and beautiful hanging tapestries by local artisans. Breakfast, lunch and dinner – think acai bowls, quinoa crackers, kale mac’n’cheese and smoked beet sandwiches – are artfully arranged on handmade tableware.